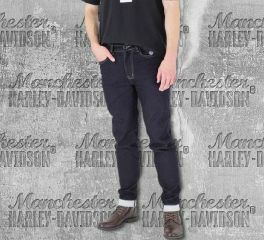 Men's Harley-Davidson® performance riding jeans. The Dalton are single layer jeans from Knox made from high performance 13.7oz Dyneema stretch denim for excellent abrasion resistance. The result is great durability, toughness, protection and cut resistance without needing any extra abrasion resistant lining. Comes with removable Knox Microlock knee and hip armor.